To print a pool pass, the price starts at $1.00 per pass. To mail a set of pool passes to a family, the price ranges from $1.50 to $5.00 per household. The final cost for your community is dependent on how complex your specific pool application is. 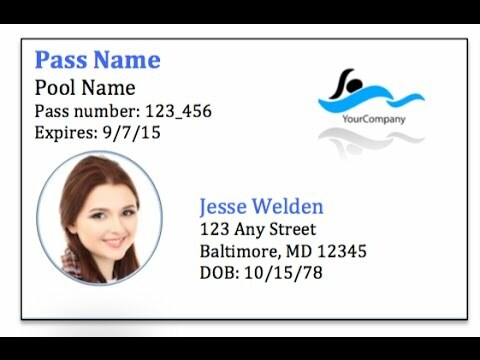 We also produce custom pool passes without a photo ID. The price is $1 per pass + $25 processing fee. Contact us so we can determine the best solution for your unique community. This video demonstrates how we serve some of our HOA communities. This is just one of the ways they can use our software. For solutions to your unique community, please contact us. This video demonstrates how we serve some of our apartment communities. This is just one of the ways they can use our software. For solutions to your unique community, please contact us. 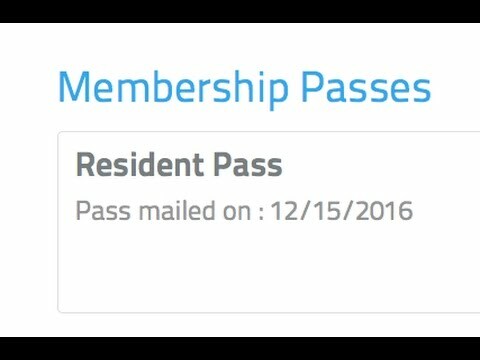 What do the pool passes look like? 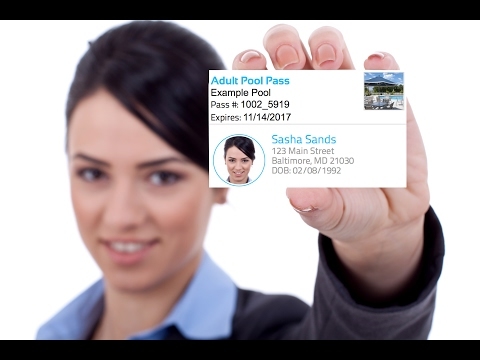 Membership passes are credit card size, 0.2 mil thick, PVC, color photo ID cards printed on a commercial photo ID printer. Guest passes and temporary passes are printed from the patron’s personal printer using 8 ½ x 11 paper. These paper passes can be collected at your pool gate. All passes are customized to your community. They contain your logo and pass policies. Click on the below images to view examples. How can I tell when my patron's pool pass was printed? - Go to MANAGE MY POOLS. - Click on ACTIVE. These patrons' accounts are active and our office has received an alert to print their pass. - Click on VIEW PASS. The date the pass was printed and mailed is displayed here. If you see two dashes instead of a date, it means our office has received the alert but we have not actually dropped the pass in the mail. Passes are typically printed and mailed within 24 hours. 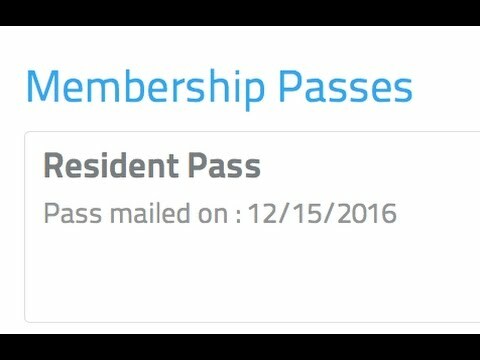 Do patrons have to use the internet to receive passes? No. Patrons can also submit a paper application to swimmingpoolpasses.com. We will be happy to process paper applications for your community. Property managers can also process paper applications. Our administrative portal is designed to help you quickly process paper applications and provide customer support for your patrons. 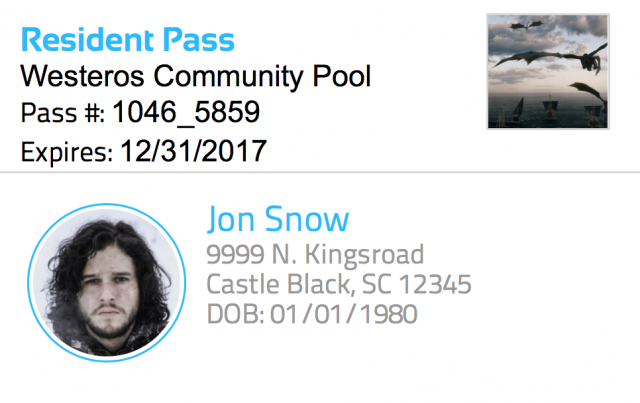 How does swimmingpoolpasses.com know who is authorized to receive passes? Our system works off a pre-approved patron list or household list. You submit a list of approved patrons or households, we will take care of the rest. Patrons can be added, deleted, activated, and deactivated as they move in, move out, don’t pay HOA dues, or finally pay HOA dues. - You set the guest pass cost. For example, $5. - The patron purchases a guest pass online for $5. - The patron prints the guest pass and presents it at the gate for entry. What is the household field in a patron’s profile? The household field is what the software uses to group members of the same family together. 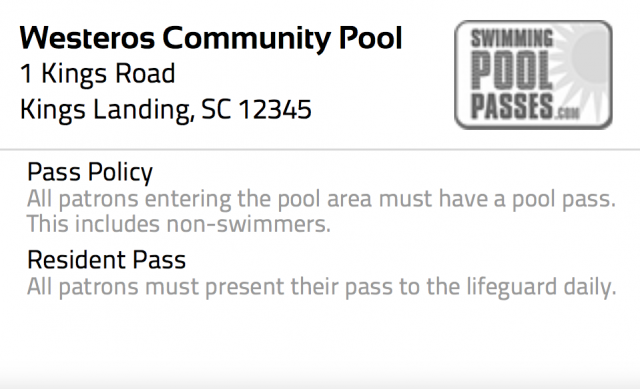 When a mom logs onto swimmingpoolpasses.com to request her pool pass, she will also be able to request passes for her husband, children, and whomever else lives in her household. What does "responsible" mean in a patron’s profile? A "responsible” patron is allowed to edit and activate other patron's profiles in the same household. 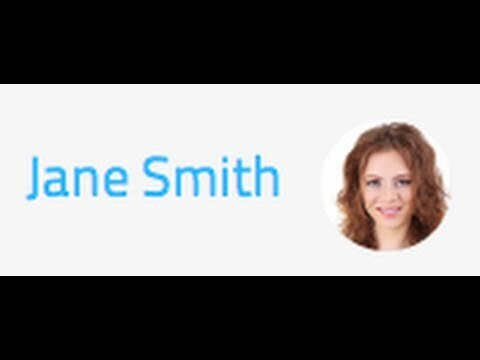 When a mom logs onto swimmingpoolpasses.com, she will be able to complete her entire family’s profile rather than having each individual log on. As a general rule, when you add a person into swimmingpoolpasses.com, make them "responsible”. The exceptions are children. How do I add a property manager to my community? Property Managers (PMs) can give administrative rights of their community to others. You may want assistants, leasing consultants, board members, pool committee volunteers or other persons to help you manage your pool. I received an activation code from swimmingpoolpasses.com inviting me to activate my community pool membership. What do I do next? If you received an email from admin@swimmingpoolpasses.com with an activation code, you have been pre-approved to receive a pool pass. Please watch the following video demonstrating how to sign up. My community uses swimmingpoolpasses.com. How do I sign up for my pool passes? - Click on POOLS at the top of this page. - Search for your pool, hover your mouse over the picture. When will I receive my pool pass? 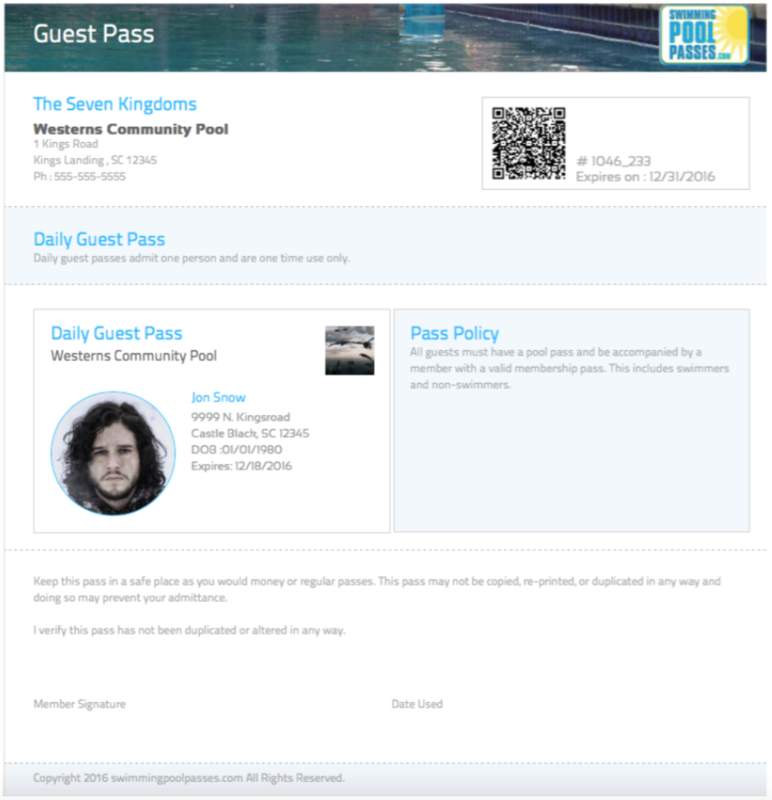 Once your account is activated, swimmingpoolpasses.com automatically prints your pass. We mail it directly to you. Please allow 7-10 days for delivery. Depending where you live, you may receive your pass(es) in just a couple of days. The only reason we would not mail a pass is if you or a family member uploads an invalid picture. In that case, a mailed on date would not be displayed. 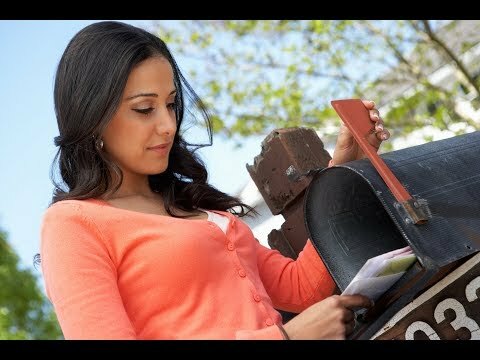 Please watch the below video to see how to find the mailed on date. Please watch the following video for a demonstration. How do I purchase a guest pass? - Click on the pool’s name. - Click on VIEW PASSES/BUY PASSES. To purchase a guest pass, scroll to the bottom. - Click the pass you want to purchase and add it to your shopping cart. - Click the shopping cart in the upper right hand corner to view your cart and check out. Enter your information and complete the transaction. After check out, you can print the pass immediately or chose to print it later. Guest passes may only be printed once. - Click PRINT YOUR GUEST PASSES NOW to print them immediately. - Click PRINT in the upper left hand corner. How do I print my guest passes? Guest passes are printed from your home printer. They may only be printed once. To print your previously purchased guest passes or to purchase guest passes, please follow these instructions. 1. Log in. The first screen you view lists your pools. 2. Click on the pool’s name. 3. Click on VIEW PASSES/BUY PASSES. 4. The next screen lists the different passes your community offers. 5. If you have purchased passes in the past, they will be listed here. 9. Your pass will appear on the next screen. 13. You have successfully printed your pass. Present this pass to the gate attendant or lifeguard. Pease watch the following video for a demonstration. How do I print a temporary pass? Temporary passes are only issued to approved patrons who have activated their account. Not all communities issue temporary passes. If you don't see the option to purchase temporary passes, your community does not offer them. Temporary passes are printed from your home printer. Temporary passes may only be printed once. To print a previously purchased temporary passes or purchase temporary passes, please follow these instructions. 1. Log in. The first screen you view lists the pools you are currently a member of. 10. Click PRINT in the upper left hand corner. What if I do not have an activation code? How do I activate my account and receive my pool pass? Activation codes are an additional verification step used by apartment complexes. If you live in an apartment, please check your email that you have listed with your apartment complex. If you need your activation code re-sent, please contact your property manager. If you live in an HOA and have applied for your pool pass online, you do not need an activation code. Your account will be activated after your application is processed. When your application is processed, you will receive a verification email from swimmingpoolpasses.com. Please allow 2-3 business days for processing.